Personalized Technology // In 2013, Disney rolled out a series of products under the banner of MyMagic+. This technology personalizes your vacation experience. You can book your ride times from home, before you even leave for vacation. A few of the newer rides create automatic digital souvenirs, which blend music, professional video and images of you on the ride. It’s reported that Disney has spent $1 billion to provide this sort of personalization to its guests. How are you leveraging data to make a better experience for people? What if we celebrated people’s birthdays and anniversaries as they arrived at our services each week? What if we generated name tags for people with a scan of their license plates as they pulled into our parking lots? 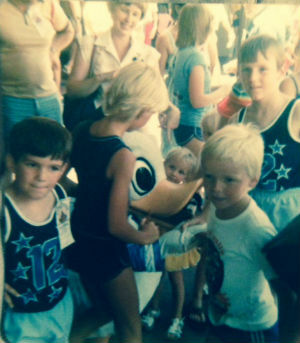 My brother and I in snappy matching tank tops having a “not so personal” character experience with Donald Duck sometime in the ’70s. More Intimate Experiences // Disney recently finished the Magic Kingdom’s largest expansion in its history, with a completely redone Fantasyland. In the middle of many great new attractions is Enchanted Tales with Belle. It’s an almost 30-minute small group experience where you are face to face with Belle from Beauty and Beast while kids re-enact the story. Don’t miss this … Disney could have invested in a new show, ride or theater experience … but they chose to structure an incredibly intimate time where families interact directly with the story. Growing churches need to fight the urge to move people into larger and larger crowds. How can you break your ministry into smaller communities to give intimate growth experiences? Where is the “mid-sized” community being developed at your church … between the large gatherings and small groups? Global and Local Expansion // I asked a long-time “cast member” at Disney World when the slowest time of the year is now. He commented that Disney has done a lot of global advertising to draw in guests from around the world, so there really isn’t a slow time of year due to varying vacation schedules. At the same time, WDW just opened a massive parking garage called Disney Springs as part of a new expansion project targeted at Central Florida residents and people vacationing at other Orlando attractions. Increased Re-Rideability // Disney changes some of its rides so they are different every time you ride them. The Star Tours ride at Hollywood Studios has 54 potential variations in the story line. The Toy Story Mania ride is essentially a 3D video game that you travel through … begging guests to ride it again to increase their scores. The new Test Track ride at Epcot allows guests to design their own futuristic car and then see how it performs … again implicitly inviting guests to come back and tweak their designs. These changes are a far cry from the “It’s a Small World” generation of rides where guests experienced the same thing for decades. Are you offering variety in your experiences so that people have a sense of anticipation when they come to your church? What is the balance between offering a repeatable experience that you can do with excellence and fresh experiences that keep people engaged? How are you adding elements of surprise and delight into what your church does to keep people interested and coming back? The Experience Before the Experience // Let’s be honest … a big part of a Disney World vacation is standing in line and waiting for something to happen. It’s a pretty ingenious business model really! I’ve noticed that throughout the park Disney attempts to make these “waiting” experiences as elegant and entertaining as possible. At the classic Haunted Mansion there is a bunch of new interactive elements designed to entertain and delight guests before they enter the ride. The queue for the brand new Seven Dwarfs Mine Train ride includes games and all kinds of fun stuff to do while you wait for your turn on the train. Even the Pinocchio Village Haus restaurant has menus with really cool animations to look like they are built by a cuckoo clock maker! All of these small sub-experiences help you enjoy the experience before the experience … whether that’s a $100 million roller coaster or a $10 chicken burger! Where do people “wait” at your church? How can you add to those experiences to make them great? Can you get a volunteer to stand with folks as they check in their kids … maybe handing the kids treats or stickers? What happens before your service as people arrive? Could you do something in the foyer to welcome people and build anticipation?